I once desperately want to meet her so I decided to train Bartre until level 5 warrior. We can find Karla in arena before fight Limstella. In Fire Emblem: The Blazing Sword, player can get Karla- Bartre’s support conversation level A. Bartre is once fuzzy about her because she is very cool and only seek for her brother. Bartre is the one approaching Karla first. Bartre always asking Karla to fight him and end up by ignorance. In the end, if player get A level, Karla and Bartre will get married and have one daughter namely Fir. Bartre finally find himself fall in love with Karla. That noisy and dense Bartre has such a lovely and formidable wife and a cute and detached daughter! I wonder about Karla’s taste (^_^). Fir plays role in Fire Emblem: Fuuin no Tsurugi (English version: Fire Emblem: The Sealed Sword) – the former series of Fire Emblem: Rekka no Ken. And you know what? Psst... it’s very nice to get Fir because she just like her mother. Venus trap! Beautiful and dangerous. I found it’s very cute conversation between Fir and Noah (laugh). Karla has a big brother who also a swordmaster named Karel. Their blood are sword based. I presumed. 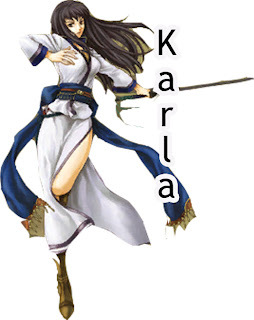 Karla is an average swordmaster if we compared with Karel. I like her because of her critical hit that she can do. Sometimes, Karla will get OHKO (One Hit Knocked Out) to her enemy make it very awesome parts. In Fire Emblem: Fuuin no Tsurugi, Karla is passed away because of illness so that Fir want to wander honing her skill just like her mother. Sometimes, Fir bump over her father, old Bartre and her uncle, old Karel.